Bugs That Look Like Cockroaches - What Do You Think? Bugs That Look Like Cockroaches – What do you think? If you have found an insect in or near your home, you may be wondering what it is. There are several bugs that look like cockroaches but definitely aren’t. It is essential that you know what kind of pest you are dealing with before you can figure out a route to extermination or resolution. Below you will find information on the bugs that look like cockroaches and how to decipher between the insects, even if there are only miniscule differences. Cockroaches are disgusting little bugs. They often carry diseases with them. Cockroaches leave feces all over your home which can cause severe ailments in the elderly and small children. Otherwise healthy individuals can usually withstand the germs, but the others don’t stand a chance. Cockroaches are covered in an exoskeleton. They molt several times as they attempt to reach maturity. The bug most often mistaken for a cockroach is a beetle because of their similar characteristics. These pests are nocturnal and often are only seen during the day when there is an infestation present. Cockroaches easily infest homes while many of the other bugs that look like cockroaches do not. Determining which pest is present in your home is important, especially for peace of mind. The bugs listed below are the most commons bugs that are mistaken for cockroaches. While some of them obviously look similar, the view up close will tell you the real story. June bugs are often mistaken for cockroaches. They are the number one bugs that look like cockroaches. If you aren’t familiar with them, you may not be sure which bug is which when faced with one of each species. Generally these bugs are harmless but incredibly annoying. They do not carry the diseases cockroaches do and primarily eat a leafy, mostly-vegetarian diet. There may be some damage to plants in your yard or garden, but there will not be a huge infestation of June bugs in your home. Their sense of direction isn’t good and they often fly into things, including people. You may hear them buzzing around in the summer. If you have a porch light on during the summer evenings, the June bugs may be attracted to it. Stepping on a June bug will yield a crackling noise as the exoskeleton crushes underneath your food. While up close you may be able to distinguish this pest from a cockroach but at first glance the differences aren’t usually noticeable. The ground beetles have a striking resemblance to cockroaches. In fact, these bugs that look like cockroaches are often mistaken for oriental roaches from afar. Both are black and shiny, and emerge at night to hunt and scope things out. The ground beetles’ exoskeletons are harder than the cockroaches, and when stepped on will give a crunch under your foot. You may assume that all insects are pests, but the ground beetle is a good insect to have in your yard or garden. They will eat other insects that may harm your crops. If you find a ground beetle in your home, it is recommended that you return it to your yard instead of killing it in order to keep the cycle of nature going. While these bugs look like cockroaches, the two are definitely not one in the same. Differences can be spotted up close, but from a distance they do resemble the oriental cockroach. Crickets are also bugs that look like cockroaches. Their similar physical appearance is about as far as the similarities go though. Crickets are beneficial to the environment and even when they are loud and annoying in the summer, they are still more pleasant than the disease-filled cockroaches. Crickets can be brown or black, like cockroaches. Their sizes are a little different, with the crickets being smaller. Crickets also have a softer exoskeleton than the cockroaches do. If you find a cricket in your home, there is less worry. While they can do some damage to your home and items in it, the level of infestation or damage will never be what you would imagine from a cockroach. You will likely be able to tell the difference between the two upon closer examination, but from far enough away they do bear a slight resemblance. Three different species of boring beetles look like cockroaches at first glance. The boring beetles join the ranks of bugs that look like cockroaches, but fall at the bottom when it comes to the closet match. When you are looking at a boring beetle up close you will be able to tell the difference between it and a cockroach. From further away the boring beetles look similar cockroaches, enough to question which insect they really are anyway. The boring beetles are roughly the same size and shape, but cockroaches move faster than the boring beetles. Beetles can occasionally be harmful to your yard, but they are not the type of insect to infest homes. If you are experiencing a higher than normal volume of bugs and your aren’t sure whether they are beetles or roaches, chances are they are the latter. Water bugs and cockroaches are often mistaken for one another, and people sometimes refer to roaches as water bugs or vice versa. While it is true that water bugs are bugs that look like cockroaches, they are two totally separate species and should be recognized as such. Cockroaches are not aquatic insects, and water bugs are quite fond of the water. Also, the cockroaches have six legs and the water bugs have two pairs of legs (four legs total), one set is small and one set is larger. 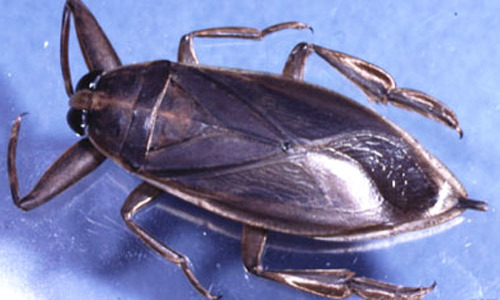 The water bug and cockroach colorings are similar shades, and both have wings. You will be able to identify which species is which by finding out if the specimen swims or just dabbles in the water for a mere few seconds. This is another beetle that belongs in the bugs that look like cockroaches category. It is only seen in the southwestern region of the United States, so it may not be as commonly known as some of the others. Easily mistaken for cockroaches, these palo verde beetles take up to four years to mature and emerge from the soil. They remain in the soil where they hatched until they reach maturity, nibbling on tree roots and other various items to survive. Unless you are closely looking at both the palo verde beetle and the cockroach side by side, the differences are not very distinguishable. You will easily get confused between the two if you are a far enough distance away. These leaf-footed bugs are definitely one of the more odd comparisons to cockroaches, but sometimes they are mistaken for one another. Leaf-Footed bugs are one of the bugs that look like cockroaches, but definitely not the most similar. These bugs are found on walls and in window sills in your home, usually in the late summer or early fall. Because of the climbing on walls and the slight similarities in appearance, people often mistake the leaf-footed bug for a cockroach. Both insects have wings, both can be brown in appearance, and both are roughly an inch long. The leaf-footed bug has different markings than the cockroach does but until you are looking at it up close, the differences aren’t incredibly distinguishable. These Asian longhorned beetles are part of the group of bugs that look like cockroaches. They are fairly new to North America and are particularly dangerous to various trees. From afar the Asian longhorned beetle looks similar to a cockroach, but their reach is a lot longer. Both species’ bodies are in line with one another, but the Asian longhorned beetles’ antennae can grow up to four inches further from it’s body. Up close you will be able to tell the difference between the two bugs but from afar the Asian longhorned beetle could easily be mistaken for a cockroach. It is apparent that many of the bugs that look like cockroaches are in the beetle family. They share similar traits with their exoskeletons and colors. While some of the sizes are off-kilter, there isn’t one species significantly bigger than the other. At first glance many of these species will give the impression of a cockroach, which is why you need to attempt to identify what you are dealing with before proceeding any further. Pest control for several of the insect species are handled differently. Some of the bugs do not need to be exterminated while others should be dealt with immediately. Cockroaches are ones that need to be handled promptly because if they are not, you could have a potential health hazard on your hands. Before buying anything to eliminate these pests from your home, make sure you know what you are dealing with and read the warning labels really well. Some of the bugs that look like cockroaches aren’t responsive to insecticides, like the Asian longhorned beetle. Do your research on each pest and learn how to fight them accordingly.